Buying live plants and getting them bare-root is always an iffy business. Most of them do fine when they are potted but sometimes--and you can't blame them--they throw a hissy-fit and refuse to revivify. This haworthia looked a little stressed when it arrived but otherwise healthy, with an abundance of thick, fleshy roots. However, over a period of a month in a mixture of pumice and turface, it has slowly lost its turgidity, looking increasingly stressed. Not surprisingly, there are no information online on how to troubleshoot this particular situation because, clearly, everyone else on earth was born knowing what to do. Fortunately, Mr. Everyone Else in this forum had an idea how to deal with this suffering haworthia. On their advise, the thing to do was to dig out the plant in order to examine the roots. There are two distinct possibilities here--the plant has lost its roots but is growing new ones or it just lost its roots, period. In the case of this struggling haworthia, all it took was a very light tug since it has not established itself in the pot at all. In fact, it has lost all but two of its healthy fleshy roots and the remains had to be plucked out carefully so they do not become food for fungus when it is repotted. The failure of its roots is what caused this plamt to dry up since it was not able to take up water. The good thing though is that the plant was healthy enough to start with. So even as it was losing its old roots, it was developing new ones. When it arrived, this plant had 5 fleshy roots. It's that cream-colored protrusion you can see in the photo on the right. There is another, smaller one right behind it. Since there are new roots on the plant, it was returned to the pot and careful watering was resumed as before---small shallow sips, once a week or even every three days, depending on the temperature. Now WTF does it mean "small, shallow sips", you ask? Yes, I wondered that too. Look carefully at where that root is--see that? It's one stump, about a centimeter long. To reach that when watering, you need a spray bottle. A few directed squirts will moisten the substrate around that root, encouraging growth. Remember that since there are no roots to absorb the moisture, soaking the pot now will just force the plant to sit in water too long. Haworthias are what can be safely considered slow but accurate talkers, i.e. when it gives you a sign of recovery, it does not normally turn around and change its overall trajectory unless you overdo your reaction to this recovery. When your plant starts plumping up, stay on your course. DO NOT increase watering frequency or start fertilizing it or increasing the amount of light it gets. The recovering plant is most sensitive at this stage. Just keep at this shallow watering until your plant actually starts to put out new growth. Keep watering the plant very carefully, making sure not to drench the center of the rosette. The perfect tool for this is a basting syringe--water around the perimeter, directing the jet of water towards the center so that the roots will get some whiff of moisture while avoiding getting the leaves wet. Misting will work as well, it is said. But I don't mist. 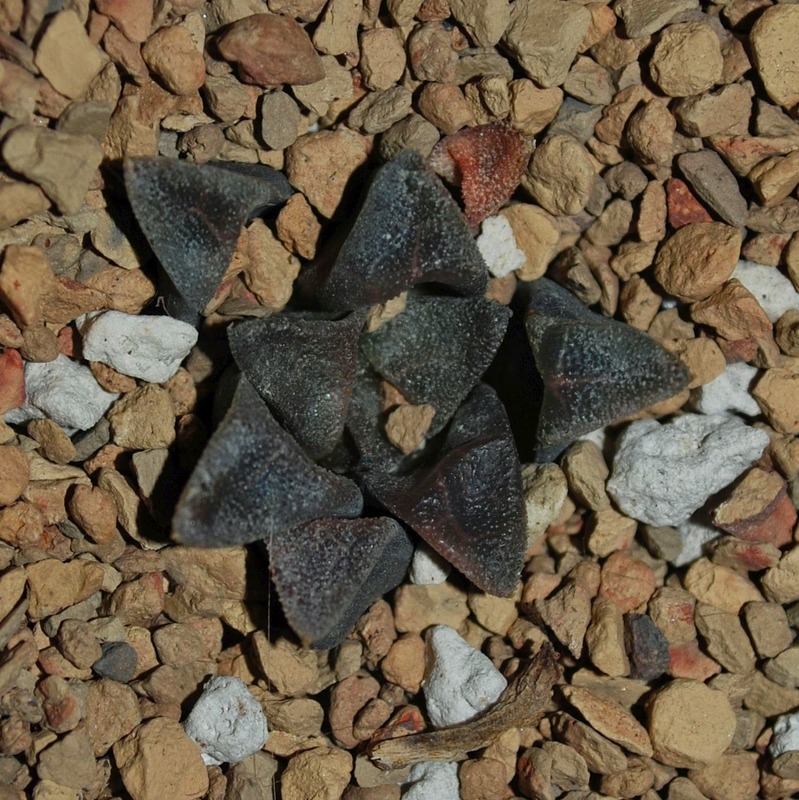 Depending on your conditions, a troubled haworthia will normally recover after two months of careful watering. This H. bayeri did so in about that time and other more vigorous species such as H. mutica or H. truncata will recover faster. The first indications of recovery becomes visible after about a month and a half when the leaves will become visibly plump. Depending on the species, the plant will start to put on new growth. At that point, you can water the plant deeply for the first time, on a sunny and breezy day. If it is spring, you can resume the normal care, just pay attention to the daytime temperature and the approaching summer when haworthias go dormant. Then you stop watering all your haworthias and gasterias until autumn. Note that the color of the H. bayeri has changed from reddish brown to green as it stayed indoors on the sill of a south-facing window while it was recovering. It will stay indoors while in summer dormancy and go outside in autumn. Hey, your plant bears a strong resemblance to my H. dielsiana. I'm glad it bounced back. Haworthias are easily some of the most enjoyable among plants that we do not routinely eat. Unlike lithops, they have very reasonable requirements and, most of all, they do not have to bloom to look their best!